Fourteen-year-old Izzy has lost her twin. Ray was bitten by a blue-ringed octopus and died. She's alone for the first time in her life, but somehow Ray is still with her. She can hear his voice. She knows he's not at peace. Izzy is of Papua New Guinean heritage. 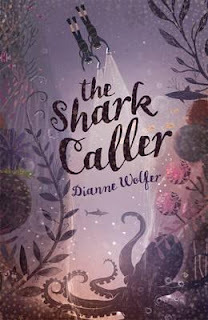 Her family come from a long line of shark callers, able to communicate with their ancestors (their tumbuna, in Tok Pisin, the language of Papua New Guinea) by connecting with the ocean creatures. But this isn't normally a tradition that is passed on to females. On Izzy's birthplace, Finsch Island, things are changing. Some of the traditional lands have been sold to loggers. Chemical run-off into the ocean is affecting the coral and marine life. Tourists aren't visiting in the numbers they used to, and Izzy's family's dive resort is suffering as a result. The sharks no longer answer the song of the shark callers. Izzy's people need someone to undertake a traditional diving ritual so that the islanders can once again be in harmony with their world. Ray was the last male in the line. Will the tumbuna accept a female and does Izzy even have the courage to make the dive? This is a lyrical, evocative story of a very different world. The traditions and customs of Izzy's family are beautifully described, and the use of Tok Pisin phrases throughout adds to the novel's authenticity. But this book provides much more than an insight into another culture. It's also the story of a young girl learning about her history and claiming her rightful place in the family. Along the way, she has to face her fears and survive an edge-of-the-seat adventure that will keep readers glued to the page.